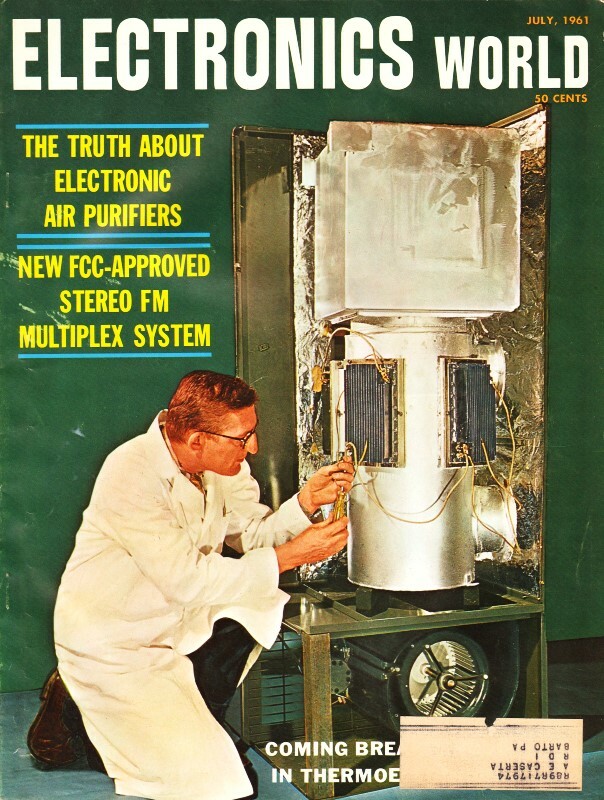 Once transistorized computers made desktop-sized systems a reality, the sure eventuality of humans being replaced by their electronic equivalents became a popular theme of media pundits. News reports and 'special features' on TV at the same time scared citizens concerned for their jobs and assured them that by the year 2000, humans wouldn't need to work anymore anyway because computers and robots would be doing everything for them. The millennium crossover occurred a decade and a half ago as 2015 draws to a close, and looking back it is true that computers and robots have usurped a lot of what used to be done manually, but, as Mac presciently predicts in this story, along with the changeover has come a plethora of new high tech jobs both for creating and maintaining those systems. 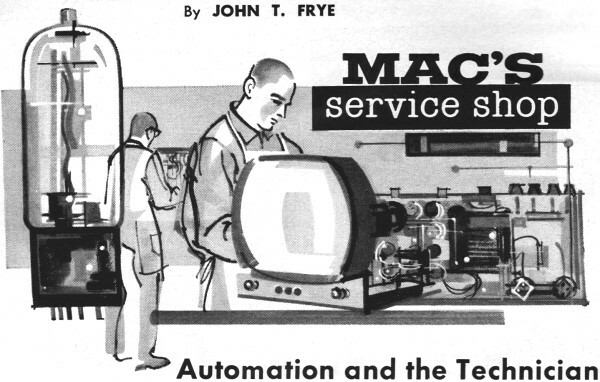 There are still many service type jobs that will never be replaced by automation, but one aspect of domestic job losses not envisioned by Mac McGregor (Frye's alter ego) is the offshoring of call service centers, doctors in Kazakhstan reading our medical x-ray and MRI images, and all the design work being done in countries most people never knew existed - using equipment and know-how provided by American companies. For that matter, he didn't predict all the service and construction jobs in the country being taken by illegal immigrants, either (try finding a legal citizen lawn maintenance guy in North Carolina or an American citizen cab drive in New York City). It was Matilda's treat. The office girl of Mac's Service Shop had made a daring safari through the blazing July afternoon sun to the corner drugstore and had brought back three chocolate sundaes. Now she, Mac, and Barney were seated in the service department contentedly spooning the luscious, high-calorie confections from their cardboard containers. Only the hum of the whirring air-conditioner broke the silence. As usual, Barney polished off his sundae first and regretfully dropped the plastic spoon into the empty carton. "Thank you, Matilda; you're a jewel," he announced; "and I can't bear the thought of your being replaced." "Being replaced!" Matilda exclaimed, looking up in shocked surprise. "Whatever are you talking about?" "I've been doing some heavy reading and hard thinking," Barney said importantly. "The reading has consisted of reports made to Congress last spring by Representative Elmer J. Holland and Howard Coughlin, president of the Office Employees International Union. According to these reports, it is conservatively estimated five million office and clerical jobs will be eliminated through automation in the next five years. In 1961 alone, computer installations will be made affecting 1.4 million clerical workers and eliminating a minimum of 350,000 existing jobs. IBM is quoted as saying it has automated only 7% of the work in U.S. offices and hopes to raise this to 35%. Yes, Matilda, I hate to think of a shiny computer sitting out there at your desk. It won't bring us sundaes; I can't tease it; and it won't be half as cute." Matilda made a face at him, but Mac noticed the happy look of a few minutes before had left her countenance. "There're lots of other reasons no machine will ever replace our Matilda," he drawled reassuringly. "No machine will be able to handle our 'impossible' customers and keep them happy. No cousin of a computer will try to convince us any job giving us trouble is a dog to end all dogs and, when we finally lick it, make us believe we have more knowledge of electronics than there is. Is a covey of transistors going to check our appearance every time we start on a service call to make sure we look clean, neat, and smart? What machine will fuss over us like a hen with two chickens when we burn ourselves with the solder gun or have the sniffles? Finally, no automatic device will light up the whole front end of this place with a smile that is just as warm and friendly at five in the evening as it was at eight in the morning." "Aw, Matilda knew I was just teasing," Barney said gruffly. "No automatic machine can ever replace a hep girl like her." "I'm glad, though, you've been thinking about the effects of automation," Mac said as he noticed the little frown disappearing from Matilda's face; "but, Barney, you wouldn't have needed to look so far from your own work for examples of jobs being eliminated by automatic processes. Automation in wiring, soldering, and component assembly in the radio-TV industry has already eliminated some 50,000 jobs, and that's just the beginning. In the telephone industry, business has increased 25% over the past ten years, but there are 30,000 fewer jobs. In 1960 42% more electric lamps were shipped than in 1950, and the productivity of workers was up 52%; yet there were 1500 fewer jobs in the industry. And it's pretty well agreed that between 125,000 and 160,000 auto workers laid off last winter will never return to the factories because automation has taken over their jobs." "Really makes you think, doesn't it?" Matilda remarked. "It should anyway," Mac agreed. "I'm convinced automation will make as much difference in the work and lives of people in the next few years as the Industrial Revolution made during the last half of the Eighteenth Century. Then a man-and-a-machine took over the work of dozens of artisans and craftsmen. Now the machine that elevated the operator to power has become so clever and sophisticated it no longer needs his immediate direction, and it is his turn to get the ax. I imagine the ghosts of the old craftsmen who were victims of the Industrial Revolution are chortling at the poetic justice of this." "I get the feeling changes brought on by automation will happen much faster than those occurring during the Industrial Revolution," Barney said. "I agree. Some change is always taking place, but the rate of change has accelerated steadily during the past few decades. Things are happening faster and faster. As Julius A. Stratton, president of M.I.T., recently remarked, 'The world into which we were born is gone; we have little or no idea of the world into which our children may grow to maturity.' Improved methods of communication, financing, and fabrication permit a new way of doing things to go from drawing board to widespread application in a very short time; and when an idea catches on, such as automation is doing, it can easily change our whole way of making a living in a few short years." "What I mostly want to know," Barney interrupted, "is how automation will affect the radio-TV service business." "Only a seventh son of a seventh son could be sure," Mac replied; "but maybe we can make some guesses. Let's continue looking on the dark side first. So far automation has principally been applied to the manufacturing process and so affects us only indirectly. Even so the indirect effect can be terrific. For example, you know how the printed circuit, darling of the automatic machine, has made radical changes in our service procedures. Unitized modular construction in the future could possibly do to us what the sealed compressor unit did to home-refrigerator servicing. This was a booming business when I was a boy. Many fellows made a good living recharging the lines with gas, overhauling compressor motors, and replacing controls. Now, when a refrigerator fails, the whole sealed unit is simply replaced; and there is very little home-refrigerator service work done." "That's a nice gloomy picture," Barney commented. "Yes, but there is a ray of light in it," Mac went on with a grin. "Not one of the refrigerator boys who really knew his refrigeration theory and kept up with what was going on in the field lost out. They simply transferred into servicing commercial refrigeration equipment and air-conditioning. Most of them today are making far more money than they did servicing home refrigerators. " "Not bad!" Mac applauded. "You must, of course, not waste time kicking on the closed door and be able to see the other door opening." ""Which, I take it, means: Don't sing the blues; know your electronics theory thoroughly; keep abreast of new developments in the field," Barney again translated. "That's the idea. Our trade magazines do their level best to keep us aware of the many opportunities opening up in maintaining industrial electronic equipment. It behooves all of us to get a foothold there while we still carry on our broadcast radio and TV servicing work. Mobile communications services are increasing tremendously, and taking care of this equipment is another string we should add to our bow. And there is closed-circuit TV, and-"
"I get the idea," Barney interrupted. "You don't need to knock me down with it. But do you think radio and TV servicing as we know it, is likely to fold in the near future?" "Fold, no; change, yes," Mac said tersely. Just think of the changes that have taken place since you started to work for me: TV grew from a novelty to the major portion of our work. Color TV came in. So did transistor receivers and printed circuits. In these comparatively rapid changes is contained a reason why I doubt automation will take over entirely in the radio and TV industry in the immediate future. Automation, to be economically practical, needs to work on a product that is comparatively stable in design. If the whole automatic production line has to be entirely revamped every little while to incorporate important improvements or simply to change models, this quickly becomes time and money consuming. As long as customers insist on a wide variety of models from which to choose and as long as manufacturers compete to please them, radio and TV sets are not likely to be entirely produced in automatic factories. Until they are, the service technician will probably not be reduced to a mere module changer. "But I've been saving the really bright side of the picture for last," Mac continued. "If you think a bit, you realize automation is working for the electronic technician, not against him. Electronics is the very heart of automation. The machines do their work, report on their progress, check their output, and examine themselves all by means of electronics. Electronic engineers play a big part in designing the equipment and electronic technicians install, adjust, and maintain it. The electronic technician will be the fair-haired boy in the automatic factory. But you are awfully quiet, Matilda. What do you think of all this?" Mac broke off. "You think automation is going to make a tremendous difference in all our lives in the near future, and you believe each of us should be thinking about what this will mean to him personally. Already many jobs are disappearing in various fields as automation takes over, and it is just starting. While automation yet is chiefly confined to manufacturing, it still has far-reaching effects in other fields, such as maintenance. Conceivably, automation of radio and TV factories could reduce the service technician to a mere module-changer, but you do not expect that to happen for some time. All the same, you think it's only prudent for the service technician to improve his general knowledge of electronics and to diversify his work and interest by taking on the servicing of industrial electronic equipment, mobile radio equipment, etc. His trade magazines are doing their best to help him in this respect if he will only study the articles they publish that are not directly connected with repairing household radio and TV receivers. "Taking the long view, you believe the well-trained, alert, progressive technician who does not insist on doing just radio and TV service will be benefited rather than hurt by the rise of automation. This is true because electronics is the heart of automation, and it will not work without the services of the electronic technician." "Did I say all that?" Mac marveled. "I'm growing old and garrulous, I reckon. But thanks for taking the notes. A machine would never have thought of doing that. Come on, Buster; let's put away the crystal ball and turn out some of these commonplace radio and TV sets. They're still our bread and butter and probably will be for quite a while."